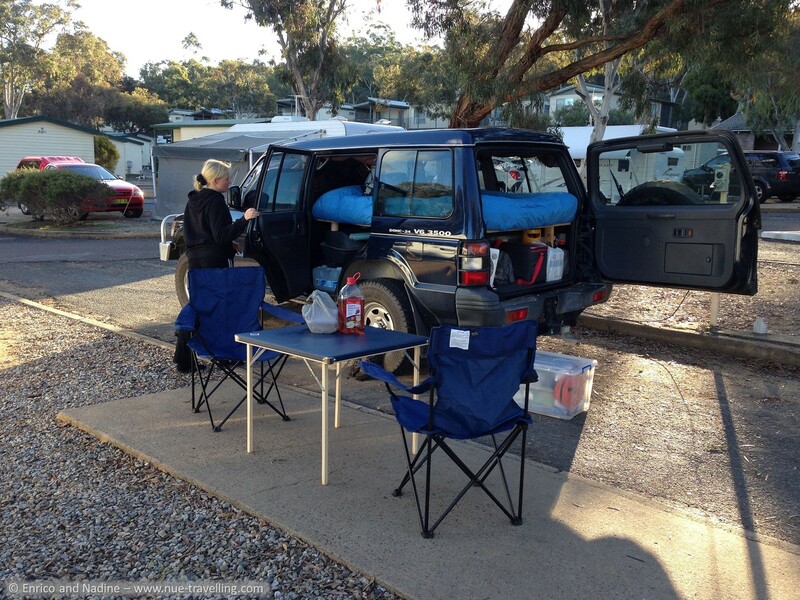 After our arrival in Australia in October 2013 - which at that time was months before our decision to start this adventure - we pruchased a four-wheel drive vehicle. Because to be able to visit the very remote areas in Down Under, such a vehicle is indispensable. 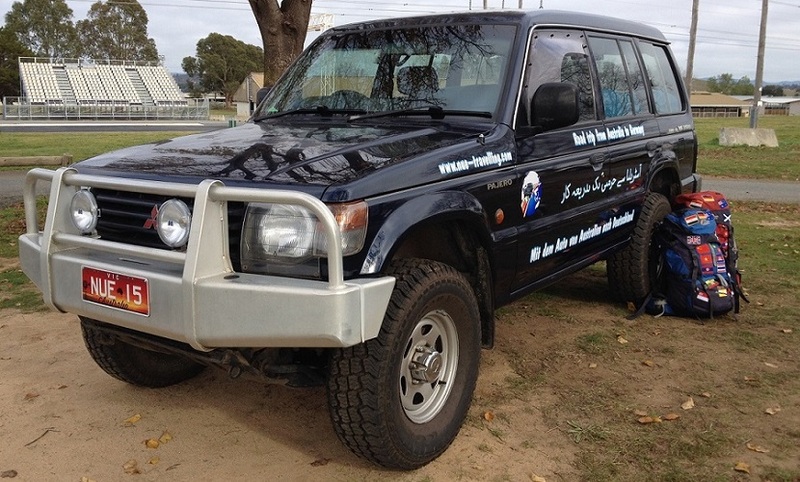 After careful searching, we decided on a 1996 Mitsubishi Pajero V6 3500 GLX. Doubtless this car does not enjoy the reputation of a Toyota Land Cruiser of the HZJ series, but here in Australia the prices of such cars are very high due to their good reputation and somewhat exaggerated for our standards and so we opted for the Mitsubishi. 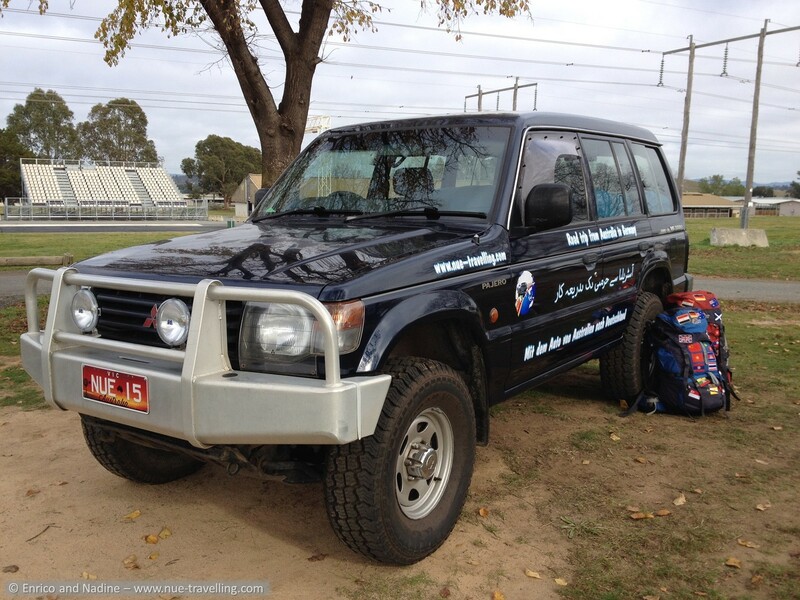 Furthermore we already gained a lot of experience with a Pajero V6 3000 in our first trip to Australia in 2010/2011. 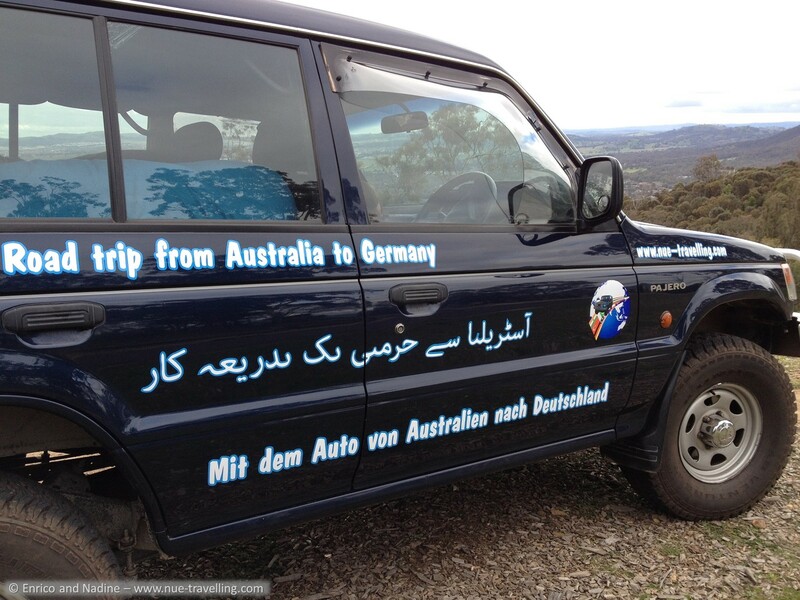 At that time the car brought us 30000 km through the country and it spared pretty much nothing ... 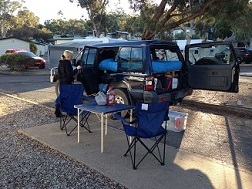 I remember us driving along the beach of the east coast of beautiful Fraser Island with doing around 100 km/h and not recognizing a bump in the sand: result: long jump with complete loss of ground contact and subsequent 'sand shower' for the windshield. That was fun! According to our previous research, in some countries on our route we will have to deal with bad to catastrophic road conditions. Moreover, it is not our intention to only get around on the main roads. Another argument for a 4WD. 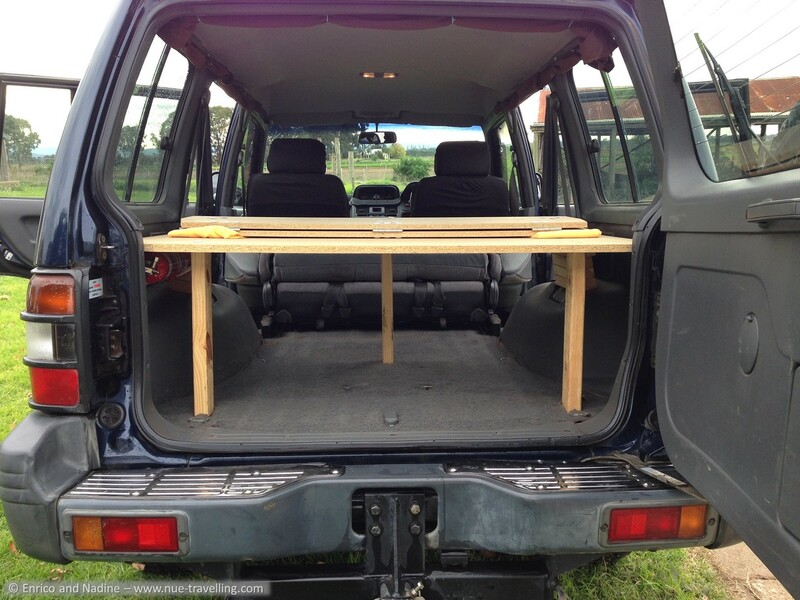 Shortly after the acquisition, we started the first replacement: the installation of a bed. We opted for sleeping in the car instead of using a tent. Advantages and disadvantages are obvious: certainly you enjoy less space than sleeping in a tent for example. 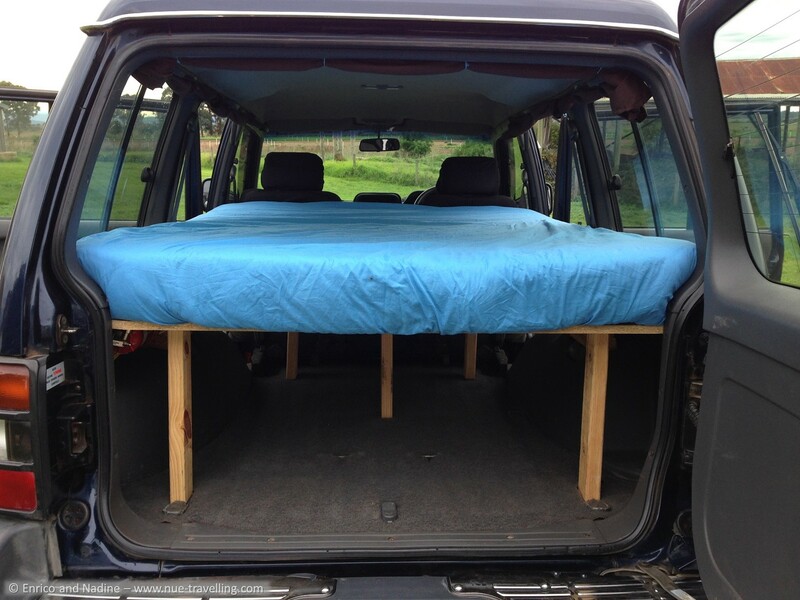 But it does not need to be assembled and disassembled every time, it is warmer, you feel safer and it also allows us to quickly 'crawl' to the front and simply drive away in case of a dangerous situation. 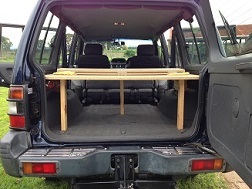 For the installation we removed both rear seats and installed a construction consisting of three 18 mm thick timber boards, which are connected by hinges. 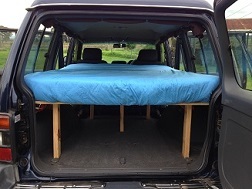 Thanks to this and detachable bed legs the bed is foldable and allows the reusing of the middle seating bench. Amongst others the car comes with higher suspension, bull bar, lens protectors and has been upgraded with additional driving lights, which with their 130W light bulbs turn night into day at a fingertip. In more rural regions of Australia, these are all things a driver cannot do without. With already more than 211000 km on the odometer at the beginning of the trip the car no longer belongs to the youngest. We felt it was important, therefore, to have the car checked extensively. The engine was completely overhauled (including all belts such as timing belt, hoses and 12 of the 24 tappets were changed), a new battery has been installed, all fluids, filters and several other wear parts have been replaced. Furthermore the car did get a set of five new tyres. All these things, some stored in container boxes, find a place in the storage space underneath our bed and in the remaining legroom of the middle seat bench. Our backpacks sit on the passenger seat during the night. 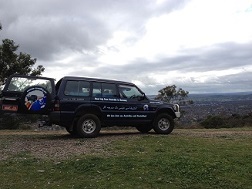 In Canberra we managed to have vehicle signs designed and fitted to our car. 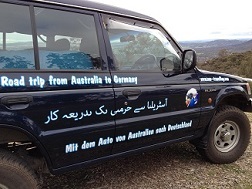 Along with a logo and our website on both sides of the car and on the spare wheel cover some lettering in English, Urdu (besides other official language in India und Pakistan) and German has been fitted. In this way we want to let our fellow people know where we come from and where we are going.